Naomi-010, born Naomi Sentzke, is a Spartan-II supersoldier. In January 2553, she was assigned to Kilo-Five, a highly covert intelligence unit under the command of Captain Serin Osman. Naomi is the daughter of Staffan Sentzke, who became an insurgent and terrorist after her disappearance. Born September 15, 2511 on the colony of Sansar, Naomi was the only child of Staffan and Lena Sentzke, both of whom were of Swedish descent. In September 10, 2517, five days before her sixth birthday, Naomi was abducted by ONI Retrieval team Theta 2 and conscripted into the SPARTAN-II program. During the retrieval process, she temporarily escaped her captors but was eventually caught. As she failed to return home in time, her family began an extensive search operation within their hometown of Alstad and the neighboring villages before a hospital in the nearby New Stockholm announced she had been found. Unknown to her family, however, this was actually a flash clone replacement. Like the other Spartan candidates, Naomi was taken to the UNSC fortress world of Reach, and for years trained under Chief Petty Officer Franklin Mendez and the AI Déjà. In 2525, she survived the subsequent augmentation procedures. Naomi's flash clone died after one and a half years. Her devastated mother came to believe that her "daughter's" death was the result of a hereditary genetic defect, and decided to undergo sterilization; she committed suicide six months later. Correctly deducing that the clone wasn't his real daughter, and that her disappearance was the result of a government conspiracy, her father developed a deep hatred for the UNSC and later became an Insurrectionist leader on Venezia. Naomi served alongside Gold Team as of early 2526. On March 5 of that year, she and eleven other Spartans were organized into an assault squad assigned to board and capture a Covenant warship orbiting the planet Netherop. She and the rest of the squad were deployed from the prowler UNSC Starry Night for an EVA boarding action in order to accomplish this task. Naomi-010 survived the Human-Covenant War. In 2553, She was selected by Admiral Margaret Parangosky to serve under Captain Serin Osman as part of a black operations team designated Kilo-Five. The team, comprised of pilot Sergeant Lian Devereaux, Dr. Evan Phillips, Corporal Vasily Beloi, Staff Sergeant Malcolm Geffen and the AI Black-Box, were sent on a top-secret mission to sow discord between different Sangheili factions through arming the dissident faction known as the Servants of the Abiding Truth. During this mission, she was equipped with a suit of newly developed Mark VII Mjolnir armor. Naomi and other members of Kilo-Five. During her time aboard the prowler UNSC Port Stanley, she learned of Captain Osman's past, that she was in fact Serin-019, a former Spartan trainee who Naomi and the other Spartans thought had died. Naomi primarily stayed back on the first three missions enacted by Kilo-Five, the delivery of tagged weaponry to Avu Med 'Telcam, the extraction of Mike Spenser on Reynes, and the attempted rescue of the UNSC Ariadne above Venezia. In February of 2553, during one of Kilo-Five's exchanges with 'Telcam on New Llanelli, Naomi spotted a Sangheili eavesdropper named Jul 'Mdama. Using her profound strength, she subdued 'Mdama and had him incarcerated onboard Port Stanley. Not long after, ONI had established communications with the human survivors inside Trevelyan: Dr. Catherine Halsey, SCPO Franklin Mendez and Spartan Blue Team. Admiral Parangosky ordered Kilo-Five to arrest Halsey. Kilo-Five entered the shield world via dropship and detained Halsey, taking her and the other survivors aboard Port Stanley. Jul 'Mdama was later placed in captivity on Trevelyan after ONI had established a local research facility. On March 3, 2553 Naomi along with the rest of Kilo-Five and Blue Team attended the Voi Memorial ceremony tributed to the soldiers of the UNSC who gave their lives during the 28-year Human-Covenant War and marked the end of the war, with small section devoted to John-117 who, in accordance with ONI policy, was listed as missing in action. Arriving at Sanghelios during 'Telcam's assault on Vadam, Kilo-Five searched for Phillips in the Temple of the Abiding Truth. They encountered several Jiralhanae insurgents attacking the temple, but Naomi quickly eliminated them. They were initially refused entry into the temple by Olar because they were non-believers. As BB negotiated with him, a nearby Sangheili crowd became aggravated by their presence. Olar relented and allowed Kilo-Five inside the temple. After they realized that Phillips was no longer inside, they evacuated as the Sangheili mob stormed the area. BB eventually located Phillips through an intercepted communication and they quickly traveled to Nes'alun Keep in Acroli to evacuate him. They extracted Phillips in the midst of a skirmish at the keep. During their evacuation, their Pelican Tart-Cart was damaged by a Banshee, forcing Devereaux to put her down for repairs. They were followed by a Phantom piloted by Forze 'Mdama, who had been sent by 'Telcam to recover Phillips for them. After being instructed to help them with repairs, Forze handed over some pipes and wire and left. While Devereaux was working on the ship, Naomi stood guard. Devereaux was then able to get Tart-Cart off the ground and return to the UNSC Infinity for proper repairs. On their flight back to Port Stanley a fire erupted and they had to re-route to the Infinity. There, they witnessed Infinity in action as it helped the Arbiter by destroying many of the Abiding Truth's vessels. Parangosky then ordered them to extract their informant 'Telcam from the ground. As Kilo-Five abducted 'Telcam from the battle, Port Stanley posed as a Kig-Yar pirate ship and destroyed a few of 'Vadam's ships in order to maintain the stalemate between the two factions. They dropped 'Telcam off on New Llanelli and were later retrieved by Port Stanley. Following the "Thursday war" at Sanghelios, Kilo-Five quickly resumed its previous task and returned to Venezia. With Spencer's help, Naomi and Vaz went undercover as UNSC deserters and investigated Venezia's black markets. During their investigation of Insurrectionist activity on the planet, they spotted Staffan Sentzke in company with the T'vaoan Sav Fel, the possessor of the battlecruiser Pious Inquisitor which Kilo-Five had been tasked with finding and acquiring. Shortly thereafter, Naomi was pulled out and substituted by Mal as her family ties might compromise the mission. While Mal and Vaz infiltrated the Venezian militia, Naomi accompanied Phillips and Devereaux to New Llanelli for another meeting with 'Telcam. Afterward, Naomi and Devereaux traveled to Anchor 10 with the Pelican Tart-Cart to retrieve a new dropship to Kilo-Five, having it immediately upgraded with the same capabilities as Tart-Cart by the Huragok Requires Adjustment. During the trip, however, Mal and Vaz were captured by the Insurrectionists on Venezia and Naomi and Devereaux were immediately tasked with the rescue mission. Naomi piloted the new Pelican, dubbed Bogof, to extract Mal, while Devereaux went after Vaz with Tart-Cart. Landing her dropship near Stuttgart armory, Naomi crashed through the roof of the building where Geffen was being held, instantly neutralizing the insurgent guarding him. Carrying Mal, she flew back to Bogof using her jetpack. Both having succeeded in their respective extractions, Naomi and Devereaux returned to Port Stanley, with Naomi's father taken captive aboard Devereaux's Pelican. Soon after, Staffan Sentzke was informed about the Spartan program and was allowed by Osman to reunite with his daughter. Staffan was dumbfounded about meeting the daughter he had sought after for so long, particularly after learning what had truly happened to her. In the ensuing exchanges between the two, Staffan asked Naomi to give up her service with the UNSC in favor of a normal family life. Although she found the prospect virtually unprecedented, Naomi feared her judgement would be clouded by her Spartan indoctrination. 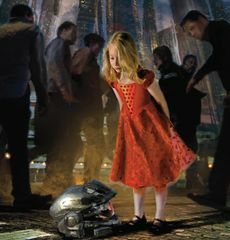 Having forgotten about her life prior to the SPARTAN-II program almost entirely, Naomi asked Black-Box to use data recorded by ONI while connected through her neural implant to trigger some of her childhood memories. Even though she became highly upset upon viewing the recordings of the early days of the Spartan program, this did not change her decision to stay with the UNSC. Meanwhile, Kilo-Five managed to track down Pious Inquisitor, which had been boarded by a Kig-Yar pirate crew attempting to commandeer the ship for themselves. Naomi and Mal boarded the ship as Kilo-Five's second boarding party, moving toward the bridge and eliminating members of the Kig-Yar crew on the way. The humans' advance soon prompted the Shipmistress, Chol Von, to set the ship to explode. Naomi and Mal escaped to Bogof; Staffan Sentzke, having fled the ship aboard a Spirit dropship and intending to escape his ONI captors, stayed in range until he could ensure Naomi was safe. While Kilo-Five made it aboard Port Stanley, Sentzke was presumed dead when Pious Inquisitor self-destructed. With the Venezian threat seemingly neutralized, Kilo-Five was granted shore leave. While the rest of the team headed planetside on Cascade, Naomi chose to remain aboard Port Stanley and watch over the Huragok Adj and Leaks. After the rest of the team returned onboard, Vaz received an anonymous package containing a planetarium lamp and a chair for a dolls' house — both of which Staffan had planned to give Naomi for her sixth birthday decades earlier — indicating he was still alive. As of 2558, Naomi is still enlisted and serving with the UNSC. However, the details of her current deployment remain classified. Naomi wearing her Mark VII suit in March 2553. Like most Spartans, Naomi is very calm and generally stoic. She is very curious, a trait she has retained from her childhood. She was interested in astronomy and wanted to know more about her father, Staffan Sentzke, after learning that he is an Insurrectionist. Consistent with the exceedingly high qualifications required of a SPARTAN-II, she was regarded as a gifted child and demonstrated exceptional intelligence. This was also noted by a CAA educational psychologist who had visited her school to perform tests on the children. Naomi is the only Spartan known to have been issued the Mark VII Mjolnir armor. Her suit closely resembles the Mark V [B], which may be a stylistic choice on her part. It sports a purplish-blue color scheme and a reflective orange visor. The cover art of both Halo: The Thursday War and Halo: Mortal Dictata depict Naomi's visor as bluish-silver, though the latter describes it as reflective orange. 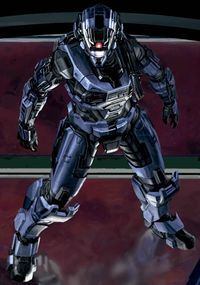 Furthermore, Mortal Dictata's cover art shows Naomi's helmet as gray rather than blue, as well as being the Mark V[B] variant as opposed to the Mark V variant. ↑ Halo: Glasslands, "Chapter 2"